Are you seeing an error message that reads: “Track by Name Mismatch”? The Track by Name code is based on the title used for the Snapshot, and if the CE_Snapshot_Name variable does not match the name given to the Snapshot, you will see this error. The two values must be an exact match. The steps outlined in this article will help you straighten things out. If you ever need to access the Track by Name variable for any Snapshot you can do so by clicking on Edit This Snapshot under the gear icon to the right of each Snapshot. Once in the Edit mode, you can click on the second step titled "Settings" to access the bottom of the page. All you would need to do to solve this error is to ensure that the correct Track by Name variable is installed on the correct page. 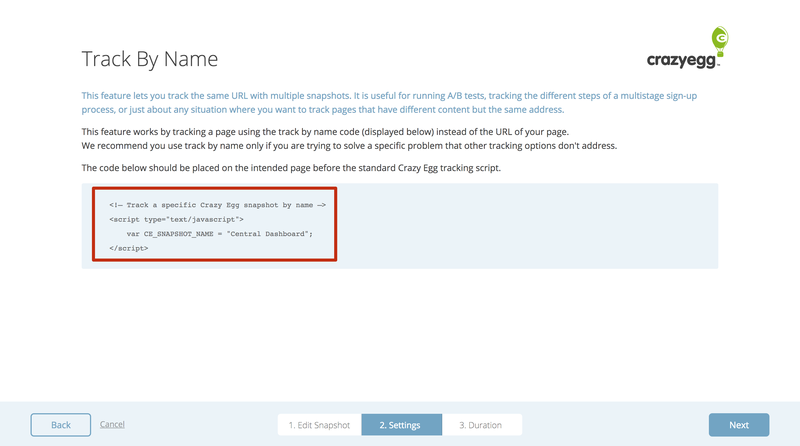 You can do this by simply pasting the variable above the Crazy Egg tracking script already installed on your site.